How does voting work in a column-based retrospective? 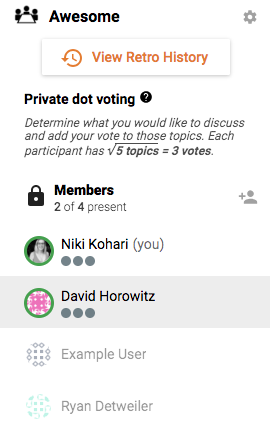 After your team privately brainstorms topics for discussion and groups like topics into themes, you'll move onto the voting phase of the retrospective. 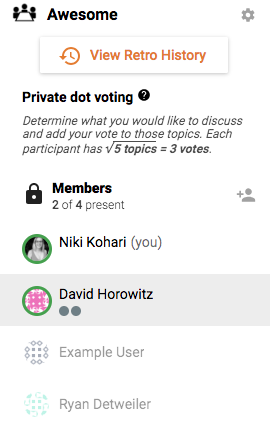 During this time, each person is able to privately vote on which topics they'd like to discuss. Retrium will then organize your topics for discussion automatically, based on which ones have the most votes. You'll easily save the time it usually takes to manually calculate and organize this information. The number of votes each participant receives for the retrospective is calculated by Retrium based on a best practices formula from Agile retrospective experts. This formula is that the number of votes for each person is equal to the square root the total number of groups and ideas in that particular retrospective. (For example, the square root of 16 possible topics for discussion = 4 votes per person). This means that the number of votes may change from retrospective to retrospective, depending on the number of topics available to discuss. The side panel on the left contains information about how many votes are available for this retrospective and the number of remaining votes for each person present in the retrospective. It’s easy to add your votes using the “+” icon near the note or group of notes. And, you can also remove votes by hovering over the vote and clicking the "x".